Surely no one’s doing sadness today. 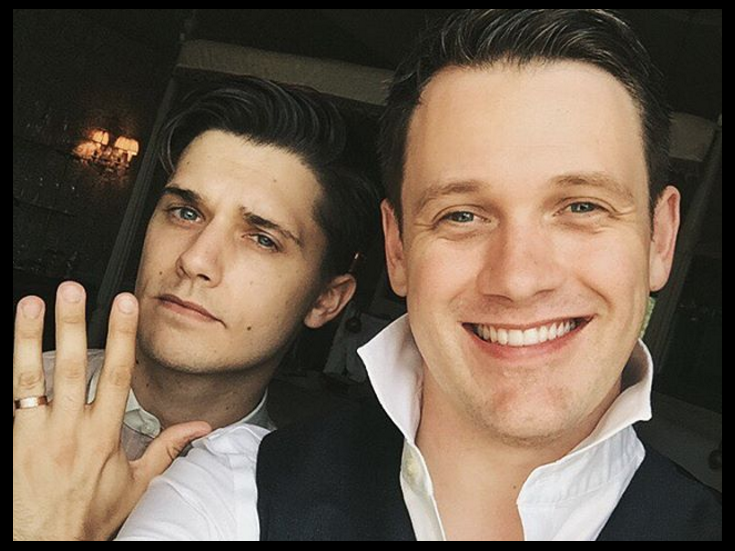 Broadway favorites Andy Mientus and Tony nominee Michael Arden celebrated their wedding on August 18. The two got engaged in June 2014. According to the Instagrams of Broadway faves such as Fiddler on the Roof’s Alexandra Silber (a longtime friend of Arden), the wedding was held at Babington House in Somerset, England. Mientus played Hanschen in the Deaf West revival of Spring Awakening, which Arden directed. The former Broadway.com vlogger’s additional credits include Les Miserables and Carrie on stage and Smash on screen. Arden received a Tony nomination earlier this year for his work on Spring Awakening; as an actor, he appeared on Broadway in Big River and The Times They Are A-Changin’. He also headlined The Hunchback of Notre Dame at La Jolla and Paper Mill Playhouse and directed Baystreet Theater’s current production of My Fair Lady.